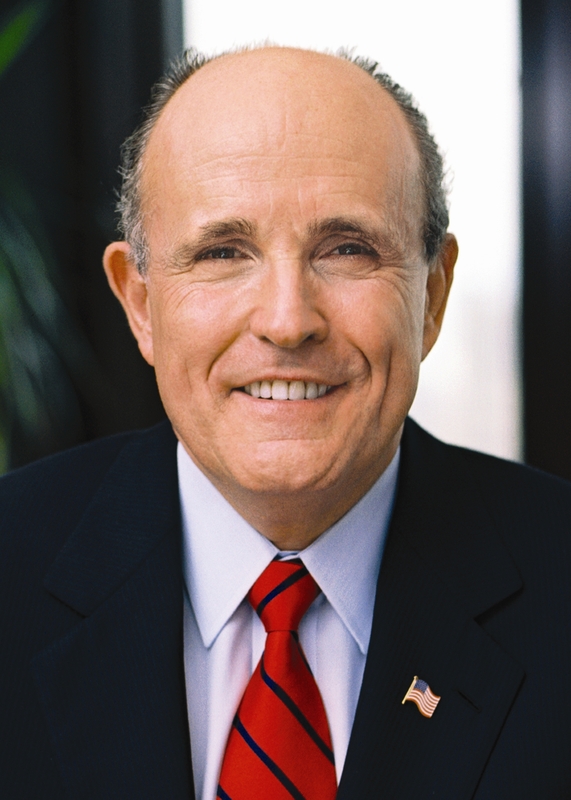 Rudolph “Rudy” Giuliani is a Republican politician who was mayor of New York City from 1994-2001, including during the 9/11 terrorist attacks. After leaving office, he launched a consulting practice and unsuccessfully ran for the Republican Party’s presidential nomination. He has become a vocal right-wing political pundit, often appearing on TV to warn about terrorists or advocate overseas U.S. military intervention. During the 2016 presidential campaign, Giuliani was a vocal supporter of Donald Trump, backing up Trump’s radical talking points, like the claim that President Barack Obama “founded ISIS.” When a CNN host said to Giuliani during an interview that the claim was factually incorrect, Giuliani retorted that “It is true in the sense that before Obama, ISIS was an almost unknown small little organization.”At one point considered to be a potential pick for attorney general or secretary of state in the Trump administration, Giuliani was eventually appointed to advise Trump informally on cyber-security issues and more recently joined Trump’ legal team advising on the investigation in alleged collusion with Russia during the 2016 elections.He quickly stirred up controversy with ill-advised statements on controversial “hush money” payments to cover up an affair Trump had; as well as on foreign policy, when he said that Trump supported regime change in Iran. The former mayor has consistently used 9/11 as a rationale for promoting hawkish policies, including during his unsuccessful 2008 presidential campaign, during which his foreign policy advisers included notable hawks and neoconservatives like Norman Podhoretzand Steven Rosen. In April 2018, Giuliani joined President Trump’s legal team. He told CNN that his task was to “push” the special counsel’s investigation toward a conclusion. He was brought on after the departure of John Dowd—reportedly due to frustration with Trump—and after numerous other large law firms and well-known lawyers spurned Trump’s requests to join his team. Giuliani took a leave of absence from his own law firm when he accepted the role on Trump’s team. Giuliani was hired by Trump despite the fact that he had been a superior in the U.S. Attorney’s Office to James B. Comey—the former head of the FBI who was fired by Trump, setting off the special counsel’s investigation. His potential conflicts of interest also touched on issues connected to indicted former National Security Adviser Michael Flynnand his connections to Turkey. Trump soon had reason to question his decision. In a conversation with Fox News host Sean Hannity, Giuliani stated that Trump had repaid his lawyer, Michael Cohen, for a payment made shortly before the 2016 election to an adult film star to buy her silence about an affair with Trump. The president had previously denied knowledge of the payment, and it raised serious questions about possible campaign finance improprieties. Giuliani also said that regime change in Iran is “the only way to peace in the Middle East” and “more important than an Israeli-Palestinian deal.” He also took a piece of paper meant to symbolize the Iran nuclear deal and ripped it up, presaging Trump backing out of the deal only a few days later. Giuliani has been a frequent paid speaker at MEK events, dating back to at least 2011 and has spoken in defense of the controversial group on several occasions over the years. In March 2017, Giuliani joined the legal team of Reza Zarrab, a Turkish national who was accused of using his own gold business, fake documentation, and other phony businesses to facilitate transactions that were banned under the sanctions regime against Iran.Zarrab tapping Giuliani was a surprise, given Giuliani’s strong support for President Donald Trump’s hard line against Iran. Zarrab had been arrested a year earlier, and despite public statements distancing himself from Zarrab, Turkish President Recip Tayyap Erdogan—in addition to other Turkish contacts with U.S. officials—personally interceded with Vice President Joe Biden on Zarrab’s behalf. Raising more questions about Giuliani’s appointment was the discovery that he had travelled to Turkey the month before to meet with Erdogan about Zarrab’s case.There was reportedly some discussion of increased Turkish help with U.S. goals in Syria if Zarrab were treated lightly, or even returned to Turkey. Prosecutors, unhappy with a plea deal turning into an international, diplomatic arrangement, called it “curious” and raised the question of conflict of interest, as Giuliani’s firm also represented banks that were “victimized” by Zarrab’s scheme. They also noted that Giuliani’s firm was a registered agent of Turkey. Giuliani, and fellow attorney, Michael Mukasey—who had served as U.S. district attorney under George W. Bush from 2007-2009—filed affidavits with the judge in the case, explaining that they were not in court to represent their client because they were working with Turkish officials to find a diplomatic solution. The judge in the case, Judge Richard Berman, reprimanded Giuliani and Mukasey. He stated, “Most respectfully, the Giuliani and Mukasey affidavits appear surprisingly disingenuous in failing to mention the central role of Iran in the indictment,” adding that the affidavits omitted any mention of Iran altogether.Berman also demanded to see the contracts Giuliani and Mukasey had signed, to see who was paying them and what financial arrangements were involved. Zarrab eventually struck a plea bargain and began cooperating with prosecutors. He was a key witness against one of his co-defendants, who was convicted in January 2018.In the end, no agreement with Turkey had been reached and relations between the United States and Turkey had soured in any case, due to the continuing U.S. arming of Kurdish groups in Syria. Zarrab was thought to have also agreed to cooperate with Special Prosecutor Robert Mueller in his investigation of former National Security Adviser Michael Flynn. Flynn’s non-disclosure of his dealings with Turkey led to his downfall, and it was noted that if Zarrab’s knowledge of discussions between U.S. and Turkish officials included anything he shared with Giuliani, he might waive attorney-client privilege and disclose information about such talks to Mueller. The centrist views Giuliani had displayed as mayor of New York on some social issues led to Giuliani being labeled a GOP moderate. However, on matters of foreign policy, Giuliani has long espoused views similar to those of hardline nationalists and neoconservatives like John Boltonand David Wurmser. Giuliani’s comments on Middle East policy during the Obama administration have cemented his militarist reputation. In February 2012, for example, Giuliani called President Obama a “weakling” for supposedly failing to persuade Iran that the United States will “bomb the hell out of them” if Iran attempts to develop a nuclear weapon. “We are the largest military in the entire world, they are a small, tiny little military power compared to us,” Giuliani said. Michael C. Desch, “Declaring Forever War,” The American Conservative, January 14, 2008, http://www.theamericanconservative.com/article/2008/jan/14/00006/. Huffington Post, “Biden: Rudy’s Sentences Consist Of “A Noun, A Verb, And 9/11,” Mach 25, 2008, http://www.huffingtonpost.com/2007/10/30/biden-rudys-sentences-con_n_70509.html. Maggie Haberman, “Rudy: GZ Mosque is a ‘desecration,’ ‘decent Muslims’ won’t be offended,” Politico, August 2, 2010, http://www.politico.com/blogs/maggiehaberman/0810/Rudy_Mosque_is_a_desecration_.html. David Taintor, “Giuliani: We Need a President Who Can Say ‘Bomb Iran,’” Talking Points Memo, February 24, 2012, http://tpmdc.talkingpointsmemo.com/2012/02/giuliani-we-need-a-president-who-can-say-bomb-iran.php. FoxNews.com, “He’s Ready! Rudy Giuliani Talks with Sean Hannity,” February 6, 2007, http://www.foxnews.com/story/0,2933,250497,00.html#ixzz1oJMpzLaY. Michael Shnayerson, “A Tale of Two Giulianis,” Vanity Fair, January 2008, http://www.vanityfair.com/politics/features/2008/01/giuliani200801.print. Huffington Post, “Biden: Rudy’s Sentences Consist Of “A Noun, A Verb, And 9/11,” Mach 25, 2008,http://www.huffingtonpost.com/2007/10/30/biden-rudys-sentences-con_n_70509.html. Michael C. Desch, “Declaring Forever War,” The American Conservative, January 14, 2008,http://www.theamericanconservative.com/article/2008/jan/14/00006/. Elias Groll, “Rudy Giuliani Loves America, Except When He’s Consulting for Qatar,” Foreign Policy, February 23, 2015,http://foreignpolicy.com/2015/02/23/rudy_giuliani_loves_america_except_when_hes_consulting_for_qatar/?wp_login_redirect=0. Jack Davis, “Giuliani Just Revealed EXACTLY What ISIS Is In 5 Words Obama Won’t Want You To Hear,” Western Journalism, November 19, 2015, http://www.westernjournalism.com/giuliani-just-revealed-exactly-what-isis-is-in-5-words-obama-wont-want-you-to-hear/. YourNewsWire, “Rudy Giuliani – U.S. Needs To Be A Police State After Paris Attacks,” January 10, 2015,http://yournewswire.com/rudy-giuliani-u-s-needs-to-be-a-police-state-after-paris-attacks/. David Taintor, “Giuliani: We Need a President Who Can Say ‘Bomb Iran,’” Talking Points Memo, February 24, 2012,http://tpmdc.talkingpointsmemo.com/2012/02/giuliani-we-need-a-president-who-can-say-bomb-iran.php. Rich Schapiro, “Rudy Giuliani knocks Iran nuclear deal during homeland security hearing at Ground Zero, Daily News, September 8, 2015, http://www.nydailynews.com/news/politics/rudy-giuliani-knocks-iran-nuclear-deal-ground-zero-article-1.2351837. Brian Montopoli, “Rudy Giuliani Denies Supporting Terrorist Organization,” CBS News, January 10, 2011,http://www.cbsnews.com/news/rudy-giuliani-denies-supporting-terrorist-organization/. Algemeiner, “Livid Guiliani Contrasts Obama With Netanyahu: ‘That’s a Man Who Fights for His People, Unlike Our President,” February 17, 2015, http://www.algemeiner.com/2015/02/17/livid-giuliani-contrasts-netanyahu-with-obama-thats-a-man-who-fights-for-his-people-unlike-our-president-video/. NBC New York, “Rudy Guiliani: There was ‘Some Celebrating’ in NYC after 9/11,” http://www.nbcnewyork.com/news/local/Rudy-Giuliani-Pockets-of-Cheering-Sept-11-911-Terrorist-Attacks-360021151.html. Haaretz, “Israeli panel: Giuliani is ‘best’ presidential candidate for Israel,” May 9, 2006, http://www.haaretz.com/news/israeli-panel-giuliani-is-best-presidential-candidate-for-israel-1.196603. FoxNews.com, “He’s Ready! Rudy Giuliani Talks with Sean Hannity,” February 6, 2007,http://www.foxnews.com/story/0,2933,250497,00.html#ixzz1oJMpzLaY. 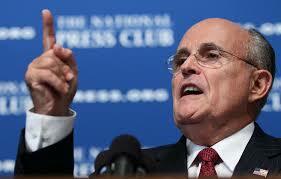 Marc Santora, “Giuliani Says Nation at War Requires Him,” New York Times, April 7, 2007,http://www.nytimes.com/2007/04/07/us/politics/07rudy.html?_r=1. Fred Kaplain, “The Man Who Knows Too Little,” Slate, June 21, 2007,http://www.slate.com/articles/news_and_politics/war_stories/2007/06/the_man_who_knows_too_little.single.html. Michael Shnayerson, “A Tale of Two Giulianis,” Vanity Fair, January 2008,http://www.vanityfair.com/politics/features/2008/01/giuliani200801.print. After The Iran Deal Pullout: Whose Plan B?